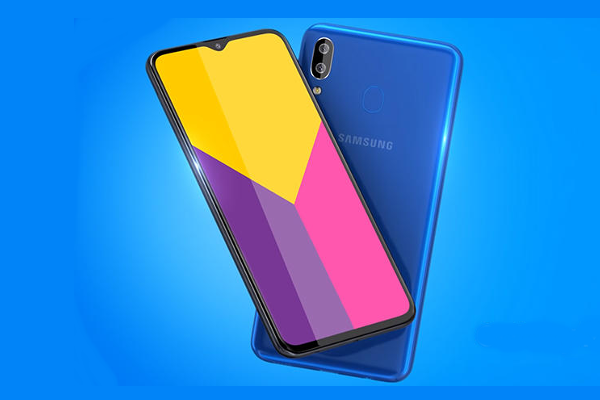 SAMSUNG Galaxy M20 and Galaxy M10 goes official with Infinity-V display. Samsung India today launched Galaxy M20 and Galaxy M10 smartphones with Infinity-V display. Samsung's new Galaxy M series smartphones come with powerful features such as dual camera with ultra-wide lens, long lasting battery, high performance processors and a new Samsung Experience UX. The Galaxy M20 comes with a 6.3" FHD+ infinity-V display with 19.5:9 aspect ratio, while Galaxy M10 has a 6.2" HD+ infinity-V display with 19:9 aspect ratio. Both Galaxy M20 and M10 come with Widevine L1 certification for seamless streaming of HD content through popular apps. Additionally, Galaxy M series comes with a new Samsung Experience version 9.5 UX (Android 8.1) which is optimized for a fast and smooth user experience. Galaxy M20 is powered by Samsung's latest Exynos 7904 octa-core processor and the Galaxy M10 is powered by Exynos 7870 octa-core processor. Samsung has packed a powerful 5000 mAh battery in Galaxy M20. The M20 comes with an in-box 15W Type-C fast charger that gives 3X faster charging capability. The Galaxy M10 has a 3400 mAh battery. Samsung's Galaxy M20 is available in 3GB+32GB and 4GB+64GB variants and the Galaxy M10 is available in 2GB+16GB and 3GB+32GB variants. Both Galaxy M20 and M10 come with dedicated storage slot expandable to 512GB and will have dual SIM VoLTE support. The Galaxy M20 comes with fingerprint as well as Face Unlock features to enhance users' security. Galaxy M10 equipped with face recognition unlock feature. Both Galaxy M20 and M10 sport dual rear camera, with ultra-wide feature. Both Galaxy M20 and M10 come with a 13MP primary rear camera that has F1.9 aperture. The secondary rear camera has a 5MP ultra-wide feature. The ultra-wide mode lets users capture more expansive photos with complete ease. It is perfectly suited for capturing landscapes, cityscapes, group photos, etc. when users want to fit a lot into one single frame. The Galaxy M20 sports a 8MP front camera with In-Display Flash, while the M10 comes with a 5MP front camera with In-Display Flash. Galaxy M20 and M10 are also equipped with best-in-class low-aperture lenses, allowing users to capture sharp, crisp and clear photos, even in low light conditions. The dual rear camera setup ensures perfect live focus portrait shots too. Samsung Galaxy M20 is priced at 12,990 (~$182) for the 4GB+64GB variant, while the 3GB+32GB variant will cost 10,990 (~$155). Galaxy M10 is priced at 8,990 (~$126) for the 3GB+32GB variant and 7,990 (~$112) for the 2GB+16GB. Galaxy M20 and Galaxy M10 will be available on Amazon.in and Samsung.com from February 5, 2019. Galaxy M20 and M10 will be available in Ocean Blue and Charcoal Black colours.